﻿ My work at the Thoroughbred farms in Kentucky always starts with the evaluation process. This is especially critical working with the foals, weanlings and yearlings. This is a process that includes the farm manager or staff member in charge of the particular horses I'm working on. 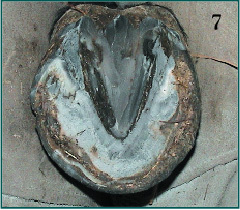 In the very early stages, when confronted with serious conformation and hoof imbalance issues that may be better treated surgically, I will ask that a veterinarian be consulted. The pressure on all parties in dealing with high dollar bloodstock makes this type of cooperation critical. I begin by having the horse walked away from me, always on a hard flat surface. This hind view allows me to look at medial and lateral deformities of the hoof capsule and the conformation of the hind limbs but it also gives me a good view of the heel length of the front feet. When they walk back to me I am looking at the front-end conformation. Is the chest narrow or wide? Are the knees, ankles and hooves in alignment in relationship to the rest of the body? This initial evaluation will usually give me some strong clues as to what I will find when I pick up the foot. 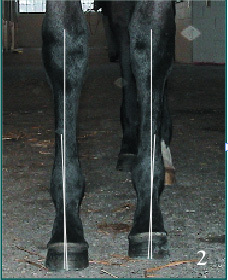 (Photo 1) shows evaluation of alignment problems - toed out at ankle, likely to have sheared heel or other medial heel problems. My biggest concern in working with the foals less than 3 months old is the ankles. The growth plates are changing rapidly and close early in the ankle area so I have to address these deformities very quickly. I will usually be making my first evaluation at the age of 2 weeks to 30 days old. I trim the feet to balance medial or lateral angular limb deformities, in an effort to even and stabilize the growth plates. 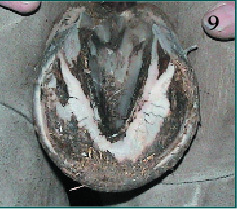 If it is not too serious a deformity we will often treat the hoof capsule by using extensions, as there is very little foot to work with in the first three months. If it is a serious toed-in (varus) deformity or extremely toed-out (valgus) the vet may do a periosteal elevation surgery. This is where the early cooperation between the farm, the farrier and the vet is critical. I never hesitate to ask the farm to call in a vet when I think the problem is too severe for the correction I might be able to offer. (Photo 2) showing ankle deformity from front, (Photo 3), showing high lateral heel, low medial heel. One of the problems in dealing with deformities of the ankle is the resulting hoof capsule distortion. 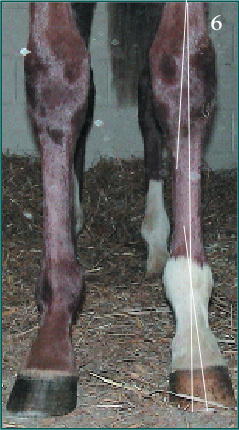 Whether I put the correction on or the foal tries to correct on its own there will be distortion to the hoof capsule. You can see from the photographs of some of the cases I worked on recently that you will often get a hoof that has a lateral flare (to the outside) and straighter medial (inside) wall. 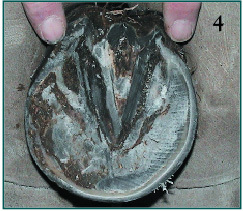 The hoof capsule of the foal in the Kentucky climate is very soft, wet and easily manipulated by compression, either weight bearing or weight shifting as in a lateral or medial extension. Unfortunately, most of the correction we are applying is creating an uneven weight bearing laterally. 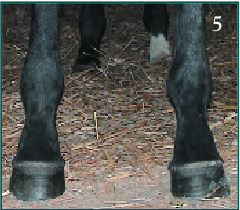 (Photo 4 & 5) showing resulting hoof distortion, lateral flare of left front. If I see a knee deformity early I will begin to consider how to approach the correction but only after I have dealt with the ankles. I think knee deformities can be dealt with as long as 9-12 months after birth. But if I think the ankles are ok but suspect the knees have a tendency to bow out I will consider a lateral extension as an option to provide support. Here again, the reality of this support option is a resulting hoof capsule distortion. We are trying to fix something above - offset knees- at the expense of the hoof. (Photo 6) shows a knee deformity. 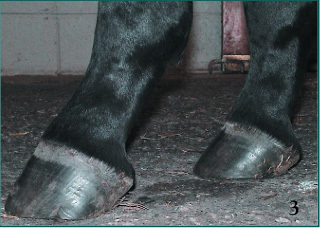 Some common problems to be addressed are deep flexor contractions that result in high heels, a mule shape to the hoof and pressures on the toe area. The excess of heel moves the heel forward, putting more pressure on the toe, sometimes even causing a separation or toe crack. I simply drop the heels moderately and reshape the toe area, often putting a bevel on the toe to aid breakover. 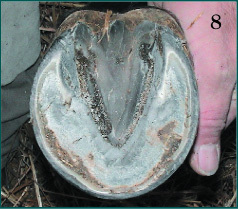 (Photo 7 & 8) - Hoof with contracted tendons with tight, high heels, untrimmed and trimmed. 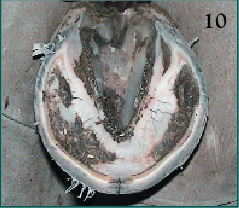 (Photo 9 & 10) show distortion of toe and crack as a result of the high heels. No matter what decisions you make when working on these young horses you have to realize there may be repercussions. Most of the time you are making decisions that have trade-offs, but that is part of the pressure of the industry. Steve Norman is a farrier living in Lexington, Kentucky. He has been shoeing thoroughbred horses his entire career and divides his time between the breeding farms and the race tracks.